Samuel May Williams House in Galveston, TX. Image available on the Internet and included in accordance with Title 17 U.S.C. Section 107. SAMUEL MAY WILLIAMS HOUSE. The two-story white frame Williams House is believed to be the second oldest home standing on Galveston Island. Construction on it began in the fall of 1839. The house was designed to face east in the center of two ten-acre garden plots about two miles from the center of town, at 3601 Avenue P. Samuel May Williams's partner, Thomas F. McKinney, supervised the construction while Williams served in the Fourth Congress in Austin, and at the same time built an identical house for himself nearby. During the summer a ten-acre garden was plowed and the detached brick kitchen built. By November a white picket fence enclosed the yard. Evidence indicates that the lumber for the house was shipped pre-cut from Maine, while the bricks came as ballast on incoming ships. Williams estimated the total cost at $7,472. The raised cottage was built on seven-foot brick piers like those at similar houses in Louisiana and had a Greek Revival entry with a gallery on the south and east sides. A parlor, dining room, central hall, and two bedrooms were downstairs; upstairs there were four small bedrooms, each with a dormer window. French doors opened from the parlor and the front bedroom onto the wide porch, which had a roof supported by classical wooden columns. Williams capped the roof with a cupola from which he could view the port with a telescope. 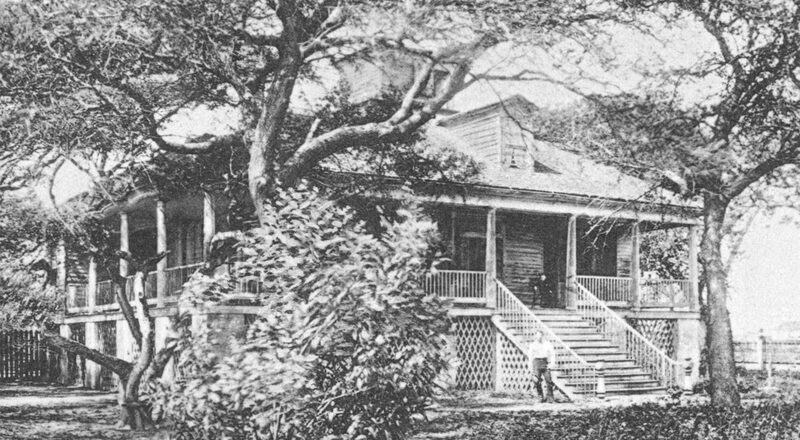 Early Photograph of the Samuel May Williams House. Courtesy of the Galveston Historical Foundation. Image available on the Internet and included in accordance with Title 17 U.S.C. Section 107. After his death in 1858 his executor, Philip C. Tucker, Jr., bought the house, which was known as the Tucker House from 1859 until 1954. Williams had modified the house during his lifetime, and Tucker followed suit. A fire in the 1890s destroyed the cupola and scorched boards on the second floor. The house survived the Galveston hurricane of 1900, but the subsequent grade-raising pumped four feet of sand underneath the building, giving the appearance of three-foot piers. The house appears to sit sideways to Avenue P, and the sizable lot has been surrounded by small residences. In 1954, when the house was threatened with demolition, a group of interested citizens organized to preserve historic homes. They formed the Galveston Historical Foundation and bought the house in May 1955. It opened to the public in 1959 and was furnished at first with donated articles, including an original German piano and lounging chair. In 1978 the foundation began extensive research to restore and refurbish the house to its 1854 appearance, including a reconstruction of the cupola. In 1984 the house opened for regular tours that include a multi-image orientation show about Samuel May Williams. Howard Barnstone, The Galveston That Was (New York: Macmillan, 1966). Galveston News, May 12, 1935. David G. McComb, Galveston: A History (Austin: University of Texas Press, 1986). Ruth G. Nichols and S. W. Lifflander, comps., Samuel May Williams (Galveston: Rosenberg Library, 1956). Handbook of Texas Online, Margaret Swett Henson, "SAMUEL MAY WILLIAMS HOUSE," accessed April 25, 2019, http://www.tshaonline.org/handbook/online/articles/ggs04.